Samsung India has announced the expansion of its service network across the country that will bring Samsung service to every corner of India. This network, which includes 535 service vans, will reach out to over 6,000 talukas across 29 states and 7 union territories. This makes Samsung’s service network the largest in this industry in India. Narendra Singh Tomar, Minister of Rural Development, Government of India and Dr. Mahesh Sharma, Minister of State for Tourism and Culture, Government of India with HC Hong, President and CEO of Samsung Southwest Asia launched the initiative by flagging off 29 service vans representing 29 states of India from Samsung’s manufacturing plant in Noida. “Samsung is committed towards providing best-in-class service across the country. With the new service initiative, our customers in rural India will enjoy the same level of speedy and high quality services as urban customers. 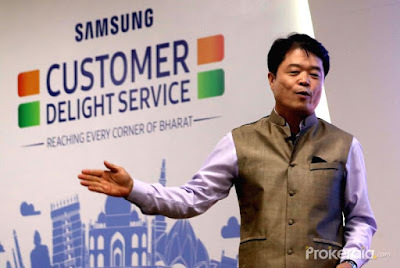 Our aim is to bridge the urban-rural service gap and we devised a solution which is ‘Made in India’ and ‘Made for India’ which will create unprecedented service delight across the entire country,” said HC Hong, President and CEO of Samsung Southwest Asia. The vans aim to provide speedy service with reduction in turn-around-time along with assured quality to each Samsung customer in every corner of India. Samsung continuously strives towards setting new customer service standards and enhancing its customer service network with new initiatives and programmes, focusing on overall customer delight, infrastructure enhancement and premium service delivery. Samsung started its operations in India 20 years ago in December 1995. Today, Samsung India has two manufacturing units, three RnD centres and a design centre, employing over 40,000 people, with the largest sales, retail and service network by any company in the country. By not only fulfilling its commitment to ‘Make in India’, but also living its promise of ‘Make for India’, Samsung has emerged as a truly Indian company at heart.